There are many benefits to going rafting with a commercial outfitter–like the fact that they take care of details such as permits, shuttles, and campsites. However, boaters who have invested in their own gear and training have the option of running a private trip on the South Fork, and frankly, with a little planning ahead of time and the proper gear, this is a pretty doable option. Here is information that will help you put together a private South Fork American River trip on your own. If you forgot any of your gear, you can stop by the River Store for last-minute essentials. You don’t need a permit to boat the South Fork on your own, but you do need a private boater tag–attach it to your raft or kayak. You can get them at places like Camp Lotus, Chili Bar, or the River Store. You also might need a parking permit depending on where you decide to park your car. 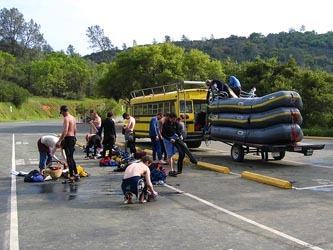 If you want to do a two-day trip on the South Fork just book a campsite at one of the campgrounds with river access like Camp Lotus or the American River Resort. Both places are very busy in the summer during the weekend, so it’s smart to call ahead and make reservations. Be mindful of parking regulations and park hours – especially at Salmon Falls! They will give you a ticket and lock your car in if you leave it there after sunset! The saying is “up the creek without a paddle,” but in this case you would be downstream without a shuttle. Starting in 2008, the River Store began a pilot program in South Fork Shuttles. Contact them for details. Another option is to go there or one of the rafting companies and see if there’s a guide or kayaker hanging out with nothing to do and willing to shuttle you car for you. You’ll want to pay them, of course. Otherwise, you’re on your own. Getting to Coloma is simple. From Sacramento, head east on Highway 50. Exit Ponderosa Road/ N. Shingle. Turn left over the freeway. Take your first right onto N. Shingle Road. Follow N. Shingle (turns into Lotus Road) for about 9 miles until you hit a stop sign (this is Bassi Road and you can turn down it to get to camp Lotus). Go another mile until you reach a 2nd stop sign. This is highway 49. You can go either direction to get to the river. The put-in for the Upper South Fork is at Chili Bar, just off Hwy 193. It’s about 10 minutes from downtown Placerville. If you’re coming from the Coloma-Lotus area, take Hwy 49 until you get into town and turn left onto Hwy 193 just before Luisa’s Italian restaurant (formerly the Taco House, if you go back that far). You’ll know you’re there when you cross the river. There are minimal fees for put-in and parking. You can put-in several places for a Gorge run on the South Fork of the American River. Furthest upstream is the Gold Discovery State Park. Call (530) 622-3470 for the latest rates. Next is Henningson Lotus Park, which also charges a small fee for put-in and parking. The furthest downstream is Camp Lotus. See http://www.camplotus.com/ for rates and season–Camp Lotus is closed during the winter. You can take-out at Henningson Lotus Park or Camp Lotus–both are on river left. Taking out at the State Park is not allowed. 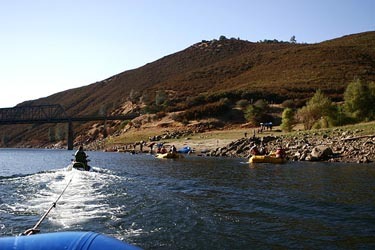 The two take-outs above Folsom Lake are Skunk Hollow (river right, upstream) and Salmon Falls Bridge (river left, further downstream). There are fees and parking can get really crowded on the weekends. Expect lots of massive buses, gear trailers and hordes of commercial boaters. Skunk Hollow may be more mellow because the commercial companies don’t take out there. Thefts have occurred; don’t leave your expensive camera sitting there on your front seat. 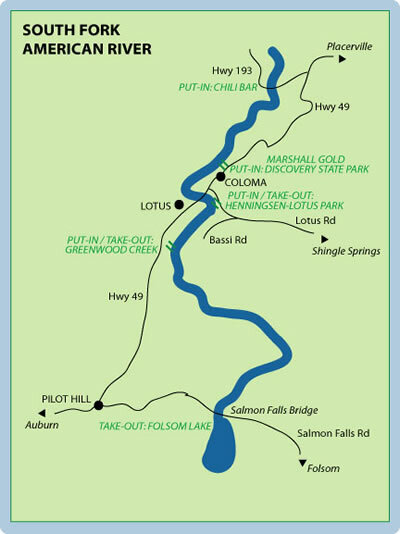 If you want to do a quick stint on the South Fork you can put-in below the class III Upper section and take-out before the Gorge run starts This allows you to do the class II section of the river that flows through the Coloma-Lotus valley. You can put-in at the State Park, Henningson, or Camp Lotus, and take-out at Camp Lotus or Greenwood Creek (BLM land), which is just after Swimmer’s Rapid, on river right. NOTE: Common sense and County law dictate that you wear an appropriate PFD on the South Fork. This applies to all boaters as well as people tubing the South Fork.